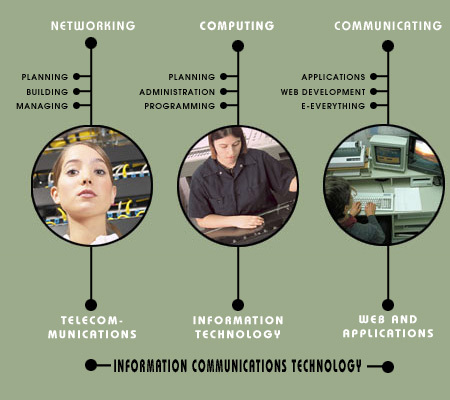 ICT: Information Communications Technology is an industry standard term used to group all the technologies that are involved in enabling people to communicate electronically. As such, it encompasses vast amounts of technical information. In an effort to diminish the complexity of choosing course work, the curriculum has been segregated into 3 major categories. TELECOMMUNICATIONS: Without an underlying communications network, ICT cannot occur. The Telecommunications (Telecom) curriculum focuses on developing the skills to build and maintain a network in the local country where applicable. Building the network will require an understanding of the different types of communications protocols, speed, and delivery mediums. In addition, capacity planning, on-going maintenance and expansion, and operational monitoring will need to be understood. This curriculum focuses on developing these core skills. INFORMATION TECHNOLOGY: This category targets those skills necessary to establish computing and applications environments in the work place (whether it be a government ministry or a private business). It requires that the student understand the basics of the underlying network, but focuses more directly above that layer answering such questions as: What types of Server environments are there to consider, how will I manage and maintain them, how do I program in them, how do I plan for expansion? WEB and APPLICATIONS: Having established a telecom network, and IT infrastructure, this category of the curriculum focuses on information delivery. It emphasizes skills required to publish (both documents and web pages), as well as how these mediums are used by different business sectors. There is duplication of curriculum between the categories. For example, an overview of networking is required for the web and applications category. Moreover, a general understanding of “E-Everything”is recommended for the Telecommunications curriculum. The categories therefore attempt to provide a mechanism for the students to decide where their true level of interest lies and adjust their course of study appropriately.